For example, the presence of large aircrafts and equipment promotes the creation of shadows and dark spots in the location. Additionally, shiny surfaces increase the existence of glare, which can decrease visual accuracy when looking for faults on the plane. Such elements must be taken into consideration when setting up industrial lighting systems inside aircraft hangars. It is important to consider that fuel spills are uncommon in aircraft maintenance sites. However, large amounts of fuel, coupled with the use of nearby handheld, task lights could result in combustion. Moreover, the abundance of fixtures that can create sparks during operation may also increase the possibility of ignition. Hence, explosion proof units must be utilized to prevent such occurrences. Glare: Large patches of glare from open doors, roof fixtures and reflections from white surfaces, including planes and helicopters, may lower an individual’s ability to see minor flaws and details during inspection. This issue arises when a light source in the area is brighter than the surface of the applicable subject or material. Light Level: Bright, clear lights are essential inside aircraft hangars, but specific requirements for each task varies, as described in Flynn (1979) and IES (1987). Based on the law of diminishing returns, illumination levels can only be tweaked up to a certain point before glare sets in due to excessive lighting. IES (1987) recommends direct, focused lighting configurations for general lighting inside the facility. Fixtures with low brightness settings must also be used to deter glare from nearby aircrafts. Task lighting should accompany a worker for close inspections, where dark spots are present. Color Rendering: The accuracy of the lighting system should be exceptionally robust during maintenance work. Artificial luminaries installed in the location must be able to perceive the colors of the aircraft in the same manner as natural light sources, such as sunlight. This requirement is highly applicable for task lighting, because a color shift in sheet metal is a primary indicator for degradation, heat and corrosion. Reflectance: The reflectance of wide surfaces indirectly affects light distribution inside the facility. Surfaces with intense reflective properties may help boost illumination and provide guidance for stray light beams. In order to achieve this, it is common for hangars to incorporate reflective materials and paints on walls and floors. This practice is persistently applicable to surfaces around sections of the hangar that deals with wings and fuselages due to the presence of shadows from aircrafts. When addressing the crucial lighting factors above, operators may take note of specific industrial lighting practices during installation, implementation and maintenance. For general illumination requirements related to maintenance tasks, it is recommended to ensure 75-foot and 100 foot-candle levels. General line inspections, including routine dent inspections, may utilize 50 foot-candle measurements. For detailed or special inspection tasks, illumination levels up to 500 foot-candles may be required. As mentioned earlier, reflectance is a major factor in aircraft lighting configurations. According to IES (1987), the following surfaces should incorporate the following reflective values: ceiling 80-90 percent, walls 40-60 percent, equipment 25-45 percent, and floors 40 percent or higher. The nature of aircraft maintenance facilities is predictable and stable. However, due to the demanding lighting requirements of tasks inside the building, luminaries are subject to meticulous inspection and maintenance. This tedious process has forced some facilities to transition from fluorescent fixtures to LEDs. The latter, with a lengthy average lifespan of 50,000+ hours and low energy requirements, offers long-term savings in operational costs and energy consumption rates. 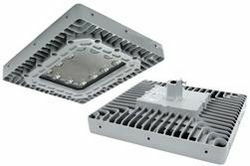 LEDs can also withstand rough treatment due to their solid state design. An example of an aircraft maintenance company that is currently benefiting from converting traditional metal halide fixtures and 10-lamp fluorescent tubes to LED lights is Duncan Aviation. In a case study that featured the company, the business needed to improve lighting conditions inside the hangar to prevent damages caused by faulty actions, like dropping tools and visual miscalculations. As a solution, the company installed six-lamp LED high bay fixtures inside the 150,000 square-foot facility. The luminaries were installed using a suspension-type configuration from the 50-foot ceiling. The installation of LED lights resulted in improved foot-candle levels (from 75 foot-candles to 100 foot-candles). Furthermore, the enhanced configuration is expected to reduce costs by up to $15,000 per year, spread across three hangars. The business was also able to avoid costly ballast and lamp replacements associated with metal halide fixtures.